Not to be confused with London School of Business or London School of Business and Finance. London Business School (LBS) is a business school and a constituent college of the federal University of London. LBS was founded in 1964 and awards post-graduate degrees (Master's degrees in management and finance, MBA and PhD). LBS is widely considered to be one of the world's best business schools and its motto is "To have a profound impact on the way the world does business". LBS was ranked 1st in Europe (2014, 2015, 2016, 2017, 2018) by the Financial Times and 2nd in the world (for Business and Management Studies; 2017) by the QS ranking. LBS' post-experience Masters in Finance programme is ranked 1st in the world by the Financial Times. The main campus is located in London next to Regent's Park in Sussex Place, built by the architect John Nash. In 2015, the school acquired the Marylebone Town Hall and spent £60 million to refurbish it with the objective of expanding its teaching facilities by 70%. LBS also has a secondary campus in Dubai that is dedicated to Executive Education and the Dubai EMBA. 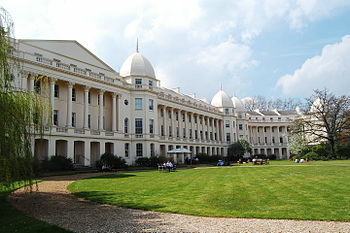 The London Business School was founded in 1964 under the name of the 'London Graduate School of Business Studies', with Dr. Arthur Earle as Dean. In 1965, the school was registered as a company and was designated by the University of London as an institution having recognised teachers. In 1966, the first Executive Development Programme was launched, followed by the Senior Executive Programme. The same year, a full-time MSc degree was also launched, with Sheila Cross enrolling as the School's first female student. In 1968, the School inaugurated the Sloan Fellowship MSc programme, which was the first one outside of the US. 17 students were enrolled and the programme was funded by the Alfred P. Sloan foundation. The first doctoral programme was established in 1969 and in 1970 Her Majesty Queen Elizabeth II opened the School's Regent's Park campus. The first PhD was awarded in 1974, and that year women made up over 15% of the student body for the first time. In 1983, the first part-time MBA programme was held under the direction of Sir Andrew Likierman, a former Dean of the School. In 1986, the school officially became the London Business School and was incorporated by Royal Charter, which gave LBS the right to confer and grant degrees. In 1992, the School was given the Queen's Award for Export in recognition of providing educational services to managers and companies worldwide. The following year, the school started its first Masters in Finance programme and in 2001, the EMBA-Global degree programme in partnership with the Columbia Business School. In 2007 a new campus was opened in Dubai to offer both Executive MBA and Executive Education Programmes. In 2009, the school started two new programmes: The EMBA-Global Asia, in partnership with the University of Hong Kong and Columbia Business School, and the Masters in Management (MiM). In 2012, the school acquired Marylebone Town Hall and restored it with the objective of expanding its teaching facilities by 70 per cent. The building was renamed "The Sammy Ofer Centre" in honour of a generous donor, the Ofer Family, who made a gift for the development of the building, which was opened in 2017. In 2016, LBS launched a new programme, the Masters in Financial Analysis, aimed at recent graduates who wish to pursue a career in finance, and acquired the lease of the neighbouring building of the Royal College of Obstetricians and Gynaenocologists, which it will occupy in 2020. With the objective of increasing its size, the school organised a £100 million funding campaign. By the beginning of 2016, it had raised £98 million, £40 million of which will be used to renovate the Marylebone Town Hall, with £28 million for research, £18 million in scholarships for students, £10 million to increase the school's endowment, and £4 million to improve technology across the school. By June 2016, the school had raised £125 million, including two £25 million gifts from alumni Jim Ratcliffe and Idan Ofer. François Ortalo-Magné, the French-born former Dean of the Wisconsin School of Business, succeeded Sir Andrew Likierman as Dean in August 2017. The campus is located in Marylebone, on the perimeter of Regent's Park. The main building, designed by John Nash, along with the entire area of Regents Park, was originally built as 26 terraced houses in 1822–23. There are ten pointed cupolas along the roof line, and the façade is adorned with Corinthian columns. LBS maintains a number of facilities, including a sports centre, restaurant, three cafes and a library, all dedicated for the exclusive use of its community. There is also a privately run pub, 'The Windsor Castle' attached to the campus. Most classrooms for the MBA are located in the Sainsbury Wing, the centre of the terrace, most of which are 100-student amphitheatre rooms. There is no accommodation on campus for students in full-time programmes, although there are rooms on-campus for visiting faculty and executive education participants. Most students choose to live in nearby private residential buildings or in students halls of residence such as the International Students House, London. LBS is expanding its campus in central London. The business school has redeveloped the Old Marylebone Town Hall into classrooms and offices as the Sammy Ofer Centre. It will further expand it in 2020 (see above). Once the application has been accepted, an examination is made by the selection committee. If the candidate meets the criteria of the school, he/she will be invited for an interview on campus in London. If this latter step is a success, the candidate receives an offer from LBS. The school's flagship programme is its full-time 15–21 month Master of Business Administration degree. MBA students take a prescribed set of core courses then choose from roughly 70 different electives. Class size has been around 400 students in every annual cohort. These are broken into 5 streams of around 80 students who take all core courses together. The admission process is highly competitive and selective. Beyond academics, the school puts an emphasis on personal and professional development including leadership, global awareness, and business skill building. These developments are facilitated via specialized workshops led by external consultants, students, and faculty. In addition to a range of elective courses at the London Business School, the school has partnerships with around 32 exchange schools around the world. Each academic year around 100 students spend a term at another leading business school. The MBA program at LBS is widely considered to be part of the top 10 in the world. In Financial Times' 2015 Global MBA Rankings, LBS ranked 2nd in the world just behind Harvard Business School. In CNN Expansion's 2014 Global MBA Rankings, LBS ranked 5th in the world. In Business Insider's 2014 Global MBA Rankings, LBS ranked 9th in the world. In 2016, the school's MBA program was ranked #21 worldwide for social and environmental impact by Corporate Knights magazine. Within Europe, LBS consistently ranks as one of the top 2 programs. In the 2014/2015 QS Global 200 Business Schools Report, the London Business School MBA Program ranked 1st among all one-year and two-year European MBA programs. Among non-U.S. two-year MBA programmes, LBS was ranked 1st by Bloomberg BusinessWeek in 2012, 3rd by The Economist in 2012, 1st by Financial Times in 2014 and 2012, and 1st by Forbes in 2011, 2012, and 2013. The MBA Programme has one of the world's largest international exchange programmes. Each year approximately 35 per cent of second-year MBAs spend a term abroad at one of over 30 partner schools, including NYU Stern School of Business, IESE Business School, Booth School of Business of The University of Chicago, The Wharton School of the University of Pennsylvania, UCLA Anderson School of Management, the MIT Sloan School of Management, Tuck School of Business at Dartmouth College, Columbia Business School, Kellogg School of Management at Northwestern University, Haas School of Business at UC Berkeley, McDonough School of Business at Georgetown University, Indian School of Business among others. The school offers four Executive (part-time) MBA degrees, which are completed in 16–20 months. At an academic level, the school offers the same degree to both Executive (part-time) and full-time MBA students. The programmes involve very similar core courses to the full-time MBA, international field work and a wide range of elective courses. The course ends with a capstone together with company project or management report. Executive MBA (Dubai). The programme begins with an orientation week in London. Following this, students take 10 core modules, which are taught in a four- or five-day block each month in Dubai. Students then undertake electives, which are primarily offered in London, and an international assignment. Two additional core modules take place in London. EMBA-Global Americas and Europe. A further 140 executives are enrolled in the dual-degree EMBA-Global Programme. It is taught in partnership with Columbia Business School. Graduates are awarded degrees from both universities. The first year involves week-long modules each month alternating between London and New York. In the second year, students select from the full range of electives available at the participating schools. EMBA-Global Asia. launched in 2008 jointly with Hong Kong University and Columbia. Teaching takes place at all three business schools. While the first year is modelled on the transatlantic EMBA-Global, the school states that because "EMBA-Global Asia is designed for people who have or will have significant trans-national responsibilities, all courses reflect a greater proportion of global material". The Sloan Fellowship was established in 1968 and is a master's degree programme designed for senior executives, accomplished professionals and entrepreneurs with significant experience of decision-making at strategic levels. The admission process is highly competitive and selective. On average, Sloan Fellows already have 15 years of management experience when being admitted to the programme. A typical class is highly diverse and includes attendees from 13–23 different countries. This 12-month, full-time master's degree programme focuses on strategy, leadership and change, and globalisation. The Sloan programme runs at Stanford Graduate School of Business and the MIT Sloan School of Management. The school offers a "Master's in Finance" ("MiF") programme on both a part- and full-time basis. Around 120 students attend the full-time programme, while 60 attend the part-time degree. In 2011, 2012, 2013, 2014, 2015 and 2017 it was ranked in 1st place amongst Masters in Finance (post-experience) programmes in the world by the Financial Times. The Masters in Financial Analysis is the most recent programme offered by the London Business School. The first class will start in September 2016 and will consist of 12 months of courses. The programme targets recent graduates with less than a year of work experience who plan to start a career in finance. Students must also complete three electives of which a minimum of two must be related to finance. The programme includes a business immersion week within a company (Google, Deloitte, CNN, Accenture, Blackrock etc.) to work on case studies. Finally, students participate in a Field Trip (study trip) that lasts a week. This travel experience consists of many networking dinners, company visits, and company presentations. The following destinations are available: Silicon Valley, Paris, Milan and Munich, Mumbai and Bangalore, or Shanghai. The MFA targets students who wish to start a career as an analyst in an investment bank or who wish to work in consulting. The Masters in Management (MiM) is a one-year masters degree in management aimed at recent graduates who have less than one year of full-time postgraduate corporate work experience or less than two years of experience in a non-traditional business role. Students must also follow 2 electives and can choose among 30 different courses. The programme includes a business immersion week within a company (Google, Deloitte, CNN, Accenture, Blackrock etc.) to work on case studies. Finally, students have to participate in a Field Trip (study trip) that lasts a week. This travel experience consists of many networking dinners, company visits, and company presentations. The following destinations are available: Silicon Valley, Paris, Milan and Munich, Mumbai and Bangalore, or Shanghai. In 2018 the programme was ranked 3rd in the world by the Financial Times, having been in the global top 10 since it became eligible for the ranking. The programme has a very good market placement. 96% of the 2015 graduates accepted an offer within three months of graduation. 40% work in consulting, 35% in finance and the rest in different industries. The most prestigious companies recruit on campus. The top 3 recruiters are the Boston Consulting Group (11 students hired in 2015), Goldman Sachs (8 students hired in 2015), and McKinsey & Company (7 students hired in 2015). Among the other companies that recruited 2 MiM students or more in 2015 are, for example, Oliver Wyman, Arthur D. Little, Deloitte, A.T. Kearney, and Bain & Company. The Global Masters in Management (Global MiM) is a two-year, full-time course starting in September 2015, where students attain two internationally recognized degrees: a Masters in Management (MiM) and a Masters in Science (MSc) in International Business. Year one takes place in London. Year two takes place in Shanghai. Delivered jointly by London Business School and the renowned Fudan School of Management in Shanghai, the Global MiM gives an unparalleled grounding in international business challenges preparing for the opportunities of tomorrow. About 10,000 executives attend the school's non-degree programmes each year. The school offers a portfolio of 31 Executive Education programmes in general management, strategy, leadership, marketing, human resources and finance. These programmes are split into two main areas, open and custom. About 45 companies per year commission London Business School to design and deliver customised corporate programmes for them, 60% of which are delivered outside the UK. In the 2015 QS ranking of world business schools (all academic programs), LBS came in 1st place, ahead of Harvard and INSEAD. In the 2014 Eduniversal Business School Ranking, LBS was ranked 2nd in the world. In the 2016 Bloomberg Businessweek ranking, LBS was named best international school. In 2017, the school was awarded 1st place in the 2-year international MBA ranking by Forbes for the 5th consecutive year, with the return on investment being the highest of any 2-year MBA in the world. The school's 150 faculty work through 16 research centres or institutes. According to the 2014 Research Excellence Framework, the school had the joint highest percentage of world-leading research of any British higher education institution (along with the Courtauld Institute of Art) with 56% of research rated in the 4* category. The school offers a 5-year full-time PhD programme. It supports 60 fully funded PhD candidates in seven doctoral programmes: Accounting, Economics, Finance, Management Science & Operations, Marketing, Organisational Behaviour, and Strategic & International Management. There are over 70 student clubs at the school. These range from professional clubs such as consulting, entrepreneurship and energy clubs, to regional clubs including the Latin American and China club. There are also general interest and sporting clubs such as football, wine and cheese and the salsa club. The Rt. Hon Terence Burns, Baron Burns – Chairman of Abbey National plc, Non-Executive Chairman of Glas Cymru, and a Non-Executive Director of Pearson Group plc. Rajesh Chandy - Professor of Entrepreneurship and Marketing. The London Business School has 39,000 alumni in more than 150 countries. Many local clubs (Paris, New-York, Zurich etc.) organise recurrent events in their city. Ted Pietka – Supervisory Board Member in Boryszew S.A..
^ "Financial Statements 2015-16" (PDF). London Business School. Retrieved 11 January 2017. ^ "Our rankings and accreditation - London Business School". Retrieved 3 October 2018. ^ "Financial Times Global MBA Ranking 2014: London Business School rises to third". 27 January 2014. Retrieved 3 October 2018. ^ "London Business School". 16 July 2015. Retrieved 3 October 2018. ^ "Top Business Schools in 2017". 21 March 2017. Retrieved 3 October 2018. ^ "Business school rankings from the Financial Times - FT.com". rankings.ft.com. Retrieved 3 October 2018. ^ a b "LBS Expansion". 30 November 2012. ^ Moules, Jonathan (15 June 2016). "London Business School raises £125m in first fundraising". Financial Times. Retrieved 16 June 2016. ^ Vina, Gonzalo (25 July 2016). "LBS appoints François Ortalo-Magné as dean". Financial Times. Retrieved 25 March 2017. ^ "Campus services". london.edu. Retrieved 31 January 2015. ^ "News". london.edu. Retrieved 31 January 2015. ^ "QS World University Rankings by Subject 2017 - Business & Management Studies". Quacquarelli Symonds. 2017. Retrieved 15 March 2017. ^ "The 50 best business schools in the world". Business Insider. 2015. Retrieved 6 February 2016. ^ "Full time MBA ranking". Economist. 2016. Retrieved 15 March 2017. ^ "Global MBA Ranking". Financial Times. 2019. Retrieved 31 January 2019. ^ "2019 Best Undergraduate Business Programs Rankings". U.S. News & World Report. 9 September 2018. ^ Kiersz, Andy. "The 50 best MBA programs in the world". Business Insider. Retrieved 4 February 2019. ^ "2016 Better World MBA results". Corporate Knights. 13 October 2016. Retrieved 30 October 2016. ^ "Where to study an MBA if you want to get paid. The best business schools in the US, Europe and Asia". eFinancialCareers. 19 November 2014. Retrieved 31 January 2015. ^ "Global 200 Business Schools Report - TopMBA.com" (PDF). TopMBA.com. Retrieved 31 January 2015. ^ "Top International Business School Rankings: MBA, Undergrad, EMBA & Online". Businessweek. 11 July 2013. Retrieved 17 July 2013. ^ Stay informed today and every day. "Which MBA?". The Economist. Retrieved 17 July 2013. ^ 1. London Business School. "London Business School". Poets and Quants. Retrieved 17 July 2013. ^ "London Business School tops 2014 FT European ranking". Financial Times. 30 November 2014. Retrieved 31 January 2015. ^ Symonds, Matt (29 November 2012). "The Best Business Schools of 2012 – The Ranking of MBA Rankings". Forbes. Retrieved 17 July 2013. ^ "MBA Rankings: London Business School". The Economist. Retrieved 10 February 2016. ^ "What is the difference between EMBA-Global Asia and other Executive MBA programmes?". London Business School. Retrieved 24 June 2009. ^ "Sloan Masters in Leadership and Strategy". London Business School. Archived from the original on 7 July 2009. Retrieved 23 June 2009. ^ "Who is the Sloan programme designed for? | London Business School". London.edu. 27 September 2010. Retrieved 17 July 2013. ^ "MiM Business Immersion Week". ^ "Business school rankings from the Financial Times - FT.com". ft.com. Retrieved 31 January 2015. ^ a b "Business school rankings from the Financial Times - FT.com". rankings.ft.com. Retrieved 3 October 2018. ^ "MiM Employment report" (PDF). ^ "Executive Education". london.edu. Retrieved 31 January 2015. ^ "QS ranking". 22 April 2015. ^ "Bloomberg Businessweek International MBA Ranking". ^ "Forbes International MBA Ranking". ^ "Research activities: London Business School, Faculty & Research". London Business School. Archived from the original on 26 May 2007. Retrieved 16 June 2007. ^ "PhD: London Business School, Programmes". London Business School. Retrieved 16 June 2007. ^ "Activities, clubs and groups". london.edu. Retrieved 31 January 2015. ^ "Jim Ball". Faculty Profiles. London Business School. Retrieved 25 March 2013. ^ "Suleyman Basak". Faculty. London Business School. Retrieved 25 March 2013. ^ "Richard Portes". Faculty Pages. London Business School. 1 December 2011. Retrieved 25 March 2013. ^ "About". Retrieved 3 October 2018. ^ "Citadel Appoints Kaveh Alamouti as Senior Managing Director to Launch Global Macro Investment Business". www.businesswire.com. 11 March 2008. Retrieved 4 February 2019. ^ "Ashley Almanza". Businessweek. Retrieved 17 March 2014. ^ Soszynski, Henry. "SHIHR & MUKALLA". members.iinet.net.au. ^ "Alumni Profile: Nigel Andrews MSc11(1978), Governor, London Business School from London Business School podcasts". podbay. Retrieved 4 February 2019. ^ "CPIER - Sir David Arculus". www.cpier.org.uk. Retrieved 4 February 2019. ^ Northedge, Richard (27 October 2007). "Mr Emap wants another Smash Hit". Retrieved 4 February 2019 – via www.telegraph.co.uk. ^ Tyzack, Anna (7 August 2015). "How a tattooed young raver unexpectedly became 12th Earl of Shaftesbury". Retrieved 4 February 2019 – via www.telegraph.co.uk. ^ Alan J. K. Sanders (25 August 2017). Historical Dictionary of Mongolia. Rowman & Littlefield Publishers. p. 104. ISBN 978-1-5381-0227-5. ^ "Kumar Birla". London Business School. Retrieved 5 February 2019. ^ Ronald D. Boire. "Ronald Boire: Executive Profile & Biography – Businessweek". Investing.businessweek.com. Retrieved 17 July 2013. ^ "Vice Admiral Paul Boissier CB MA MSc". rnli.org. Retrieved 5 February 2019. ^ "Global Advisory Council | London Business School". London.edu. 27 September 2010. Retrieved 17 July 2013. ^ Timothy W. Faithfull. "Timothy Faithfull: Executive Profile & Biography – Businessweek". Investing.businessweek.com. Retrieved 17 July 2013. ^ "LBS women - London Business School". Retrieved 3 October 2018. ^ "The Lovemarks Company – Richard Hytner". Saatchi.com. Retrieved 17 July 2013. ^ "Parliament of Uganda". Parliament.go.ug. Retrieved 17 July 2013. ^ "Astronaut Bio: Timothy L. Kopra (10/2014)". nasa.gov. Retrieved 31 January 2015. ^ Birkinshaw, Julian; Crainer, Stuart (Autumn 2009). "Covert Operations" (PDF). Business Strategy Review. Retrieved 29 April 2017. ^ Christopher J. O'Donnell. "Christopher O'Donnell: Executive Profile & Biography – Businessweek". Investing.businessweek.com. Retrieved 17 July 2013. ^ "Business Week Profile". Business Week. Retrieved 29 August 2014. ^ Allergan. Allergan (1998-01-01). Retrieved on 2013-08-12.